Several days ago, Microsoft Corporation (NASDAQ:MSFT) updated technology developers as well as interested owners of MSFT stock on how it was planning to commercialize its field programmable gate array (FPGA) microchips by utilizing them in an AI environment. The update went largely unnoticed because (1) it was overshadowed by news that the software giant and Halliburton Company (NYSE:HAL) were teaming up on a special project, and (2) not too many people really understood what it meant. Besides, Microsoft isn’t an artificial intelligence player. Why was it drifting into unfamiliar territory? As it turns out, an investment in Microsoft stock is more of an artificial intelligence play than you might think, and what the company has done to-date in the AI arena is actually pretty impressive. Microsoft’s recent project is called Project Brainwave. Although the company hadn’t kept any of the underlying components’ development a secret, the combination of the main board and the FPGA chip and the use of a deep neural network engine processing engine for real-world, real-time artificial intelligence applications was a first. Microsoft unveiled it at August’s Hot Chips 2017 conference. 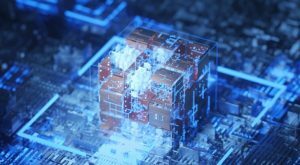 In short, traditional CPUs may be more than fast enough to power your desktop, laptop or smartphone, but that architecture is lousy at handling the massive amounts of data that must be processed by a data center to make artificial intelligence viable. There’s simply too much latency, or delay. With Project Brainwave though, the CPU doesn’t process any data. It offloads that work to the aforementioned FPGA chips, which can do so much faster … in real-time, in fact. The hardware will eventually work with all sorts of deep-learning frameworks. More important, it easily integrates into the company’s Azure cloud-computing platform. Great, but Microsoft’s limited exposure to the artificial intelligence market makes Brainwave a fish out of water? Actually, that’s not exactly the case. It has been largely unnoticed as higher-profile things like cloud computing and a stunningly expensive (although surprisingly marketable) game console have been thrust into the limelight. But, MSFT stock is very much an AI company, even if it bought its way into the market. One of those acquisitions was the purchase of Hexadite, in May, for $100 million. Hexadite uses artificial intelligence to study network attacks, and automate a defense against them. A year ago it bought a technology called Genee, to integrate into its Office 365 platform. Genee, in simplest terms, is a very fluid and intuitive voice command system that allows Office 365 subscribers to manipulate the software just be speaking commands; it “knows what you mean” even when you’re not being crystal clear. Perhaps one of the most interesting artificial intelligence deals Microsoft has made is the acquisition of Maluuba, in January. At the time, Toronto-based Maluuba was just developing a generalized though robust AI platform, without any particular project or end-use in mind. Microsoft gave it one of its first end-uses … achieving a record high score for the ridiculously difficult videogame Ms. Pac Man for the Atari 2600. It seems superfluous on the surface, and it is. It’s how it did it that makes Maluuba’s feat so interesting. Rather than a single, high-power intelligence that weighs and ranks all the possible outcomes of a decision, Maluuba’s approach aggregates several different opinions from artificial intelligence “agents”, each with a different priority … scoring points, avoiding ghosts, efficiently navigating the maze, etc. It’s an approach that allowed for the development of a solution to a third-party, un-programmed and highly unpredictable situation. That’s a feat many other artificial intelligence frameworks still can’t accomplish, as they still require so many pre-programmed, controlled (and ultimately limited) variables. It’s still going to be several quarters — if not years — before Microsoft can develop something that’s meaningfully commercial for organizations that need to tap into the power of artificial intelligence. MSFT stock holders need not hold their breath. It is coming though, and it’s going to be good. Project Brainwave solves a lot of the problems the average investor didn’t even know existed, but a problem AI engineers are keenly aware of … latency. Real-time computer-based cognition that relies on processing a vast amount of data has mostly been a technical hurdle holding them back. Microsoft’s got a true, practical solution in the works. At stake is a piece of an artificial intelligence hardware market that some suggest will be worth nearly $60 billion by 2025. Article printed from InvestorPlace Media, https://investorplace.com/2017/09/microsoft-corporation-msft-stock-ai-play/.